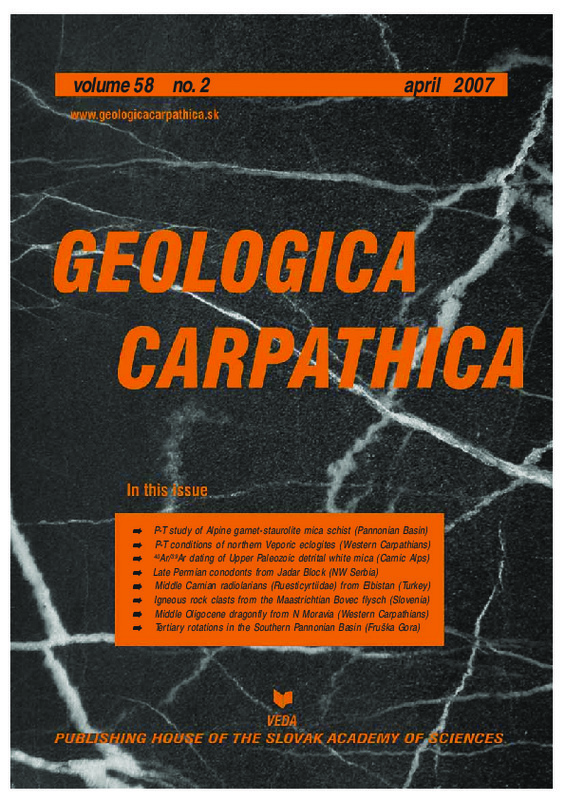 Abstract: New information on the geodynamic development and the provenance for Carboniferous to Permian successions exposed within the Carnic Alps is supplied by an integrated approach of microprobe analysis and 40Ar/39Ar dating of detrital white mica. 40Ar/39Ar analyses of detrital white mica concentrates (4–10 grains) from syn- and post-orogenic Mississippian to Late Permian successions display an apparently uniform population and time lag of the isotopic ages with respect to the stratigraphic age of their host rock: early Variscan ages (373–396 Ma) are reported within syn-orogenic Visean-Namurian turbiditic sandstones, Variscan ages (333–309 Ma) in post-orogenic Pennsylvanian and Permian terrestrial and shallow marine sandstones. Detrital white micas from Mississippian syn-orogenic sandstones indicate an intermediate time interval between the cooling of the source rock and deposition, typical for compressional accretionary wedge settings. Furthermore, these ages argue for a Middle Devonian tectonothermal event in the hinterland. Detrital white micas from Pennsylvanian sandstones indicate a very narrow time lag between post-Variscan cooling of the source region and the depositional age. This points to a rapid exhumation of rocks in the source region from mid-crustal levels prior to the deposition of these sediments. Abstract: Ruesticyrtiidae (Radiolaria) are reported from the Köseyahya stratigraphic section in the Köseyahya Nappe exposed near Elbistan town, western part of Eastern Taurides. The lowermost part of this section is composed of alternating sandstone and marl; overlying beds are represented by alternating clayey/cherty limestone, marl and mudstone. Radiolaria from clayey/cherty limestone beds are very well-preserved, diverse and abundant. The overlying strata in the section consist of ammonoid-bearing nodular limestones with tuff interlayers and subsequently “Hallstatt limestones” with abundant ammonoids. A medium- to thick-bedded, clastic and chert free limestone sequence is situated at the top of the section. A middle Carnian age is assigned to strata from the basal part of the Köseyahya stratigraphic section based on characteristic radiolarian fauna and index form, Tetraporobrachia haeckeli. On the basis of abundant and diverse specimens from the family Ruesticyrtiidae, a new genus, Elbistanium n. gen. and three new species are described: Elbistanium gracilum n. gen., n. sp., E. productum n. gen., n. sp. and Xiphotheca munda n. sp. Furthermore, emendation of Xiphotheca karpenissionensis De Wever is proposed. Abstract: About sixty well sorted (average diameter 0.8 cm) volcanic clasts with tholeiitic affinities were found in the midst of an lower Maastrichtian conglomerate outcropping close to Bovec (Slovenian Basin, NW Slovenia) and interpreted as evidence of a deltaic system. The clasts appear to be variably spilitized (i.e. albitization of plagioclase and anomalous Na content), however, they do not show any evidence of sub-solidus recrystallization. The analysis, carried out on nineteen selected samples, point out similar petrographic textures and a strong arc-type chemical signature (i.e. deep Nb negative anomaly, quite low La/Sm and Th/Zr ratio and normative corundum). Chemical data allow us to distinguish, for comparable grade of evolution, variable LREE contents which cannot be related only to crystal fractionation or to a variable grade of crustal contamination, but require compositional differences in the protolithic sources. To have an indication of the provenance of these clasts, and about their related hydrographic system, their chemical features were compared to those of similarly evolved pre-Maastrichtian magmatic rocks of different ages, locations and geological settings, mainly belonging to the Dinaridic-Carpathian region. Such a comparison seems to indicate a particular affinity with the arc-type magmas which outcropped in the Vardar Ocean in Jurassic times. In particular Bovec clasts show strong chemical similarities with metabasites from the ophiolitic complexes of the Evros (Rhodopes) and Vardar Zone, while they appear quite different from both the more depleted samples from Bükk Mountains (Hungary), and all the calc-alkaline compositions considered. The grain size of the clasts and the complete absence of recrystallization suggest a provenance from a quite delimited and close protolithic area (1–3 hundred kilometers) that did not suffer from sub-solidus recrystallization during Late Cretaceous times. Abstract: A new species of fossil dragonfly Oligaeschna Piton et Theobald, 1939 (O. kvaceki sp. nov.) is described from Middle Oligocene strata of northern Moravia and compared with all closely related species. The current record documents a rather broad distribution and probably also high abundance of Oligaeschna in Eurasia during the Oligocene and Miocene. Abstract: Fruska Gora is an inselberg in the Southern Pannonian Basin. It is partially covered and surrounded by Miocene sediments, which were the main targets of our paleomagnetic study. The aim was to see if Fruska Gora participated in the young counterclockwise rotation observed at several points in the western part of the Southern Pannonian Basin. Nevertheless, we also sampled Oligocene latites and a few Mesozoic localities. From 16 localities 14 yielded results. Geographically distributed Miocene and pre-Miocene localities with a Miocene overprint (overall-mean paleomagnetic direction: D=320º, I=54º, k=26, α95=12º) indicate that the Fruska Gora rotated in co-ordination with the western Southern Pannonian Basin close to the end of the Miocene (Early Pliocene). This rotation must have been driven by the Adriatic microplate. The overall-mean paleomagnetic direction for Oligocene latite and contact metamorphosed Upper Cretaceous flysch is D=220º, I=–43º, k=25, α95=16º (corrected for the general tilt of the Miocene sediments), suggesting about 40º clockwise rotation with respect to the present North. This means a total clockwise rotation of about 80º, occurring before the mid-Miocene and after the intrusion of the latite, possibly confined to one of the blocks of the Fruska Gora horst. It is equally possible that the clockwise rotation affected a larger area. In any case, both the clockwise and the counterclockwise rotations are important for the kinematic reconstruction of the Fruska Gora with respect to the Vardar Zone, to which it belonged originally. Future work should provide paleomagnetic data from the Vardar Zone in order to facilitate this reconstruction.